I found repeated skills in relics in Soldier mastery. I don't know if this is actually in the game or a mistake/bug in grimtools. 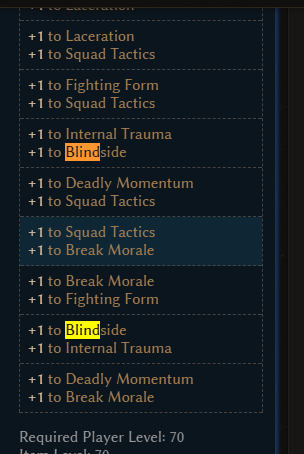 One says "+ Blindside and + Internal Trauma" and another one "+ Internal Trauma and + Blindside". I didn't check, but I'm 99% sure that it's game bug, cause I just display what's in game data in this list. Yeah, it seems like the site is down. All I get is a 500 error. Anyone know how long it's usually down for? I'll fix it when I get back from work, so probably in 10-12 hours, sorry for the inconveniences. Yes, still down. No idea how long it has been down at earlier occasions. I'm pretty lost without this awesome tool. Nice, no problem. Ty for this awesome tool btw. Could someone share offline version (win64) while site is down?